Our product range includes a wide range of wrist bands, silicone fancy bangles, multicolour wrist bands, blue wrist bands, silicone fancy bands and silicone glow wristbands. Owing to our in-depth industry experience and precise knowledge of this domain, we are offering an outstanding assortment of Wrist Bands. We have gained expertise in delivering a wide range of Silicone Fancy Bangles. The product offered by us are formulated at our unit that conforms their adherence with international quality standards. The offered products are composed of premium quality silicone, that is obtained from relevant and competent vendors of the market. 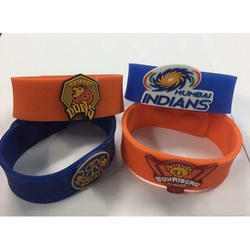 We are a prominent industry dealing in the manufacturing and exporting process of Multicolour Wrist Bands. Made under the strict vigilance of professionals, who strive to ensure complete satisfaction and flawlessness to the offered product so that it can be safely used by children and adults. 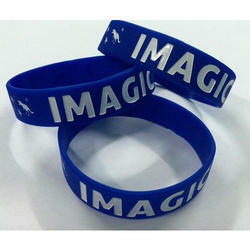 We are a stalwart in manufacturing and supplying a wide assortment of Blue Wrist Bands. In order to captivate the new generation age group, we strive to ensure complete satisfaction by providing them with quality grade product which is as per the set quality specifications. Furthermore, the offered product are available in their best competitive market price. Like by kids, teenagers and people from the nearer age group. Presented with awareness messages scribed on it. Color Available in Blue, Green, Red, etc. 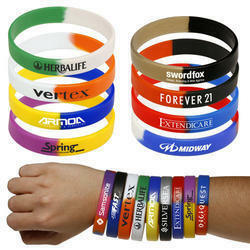 Customers can avail from us a assorted spectrum of Silicone Fancy Bands. The offered product is composed of superior grade silicon that are obtained form certified vendors, who works with adherent to The laid quality specifications. Apart from this, the offered product is checked and is verified at well defined parameters, before it is finally dispatched. For catering the variegated needs of our clients, we are deeply engrossed in offering a qualitative array of Silicone Glow Wristbands. Driven by a vision to achieve significant growth in this industry, we are committed towards providing a wide array of Silicone India Flag Tri Color Wristband. Color Available in Blue, Green, Yellow, etc. 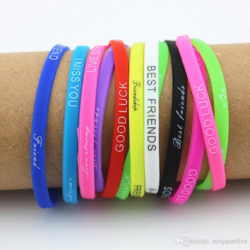 We are actively engaged in offering a qualitative range of Friendship Bands for catering the diversified requirements of our clients. Backed by years of industry experience, we are engaged in offering a premium quality range of USB Silicone Wristband. 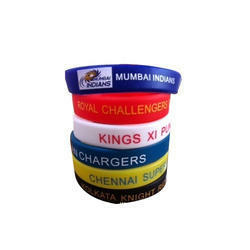 In order to fulfill the demands of our esteemed clients, we are engaged in providing an optimum quality array of IPL Team Wristband. Looking for Silicone Wrist Bands ?